A new month means a new list of car events in the Kansas City area. Kick-off your August with cruises in Parkville, Spring Hill, or Independence. Or enjoy church car shows in Lee’s Summit or Olathe. See racecars in action in Kansas City, Kan. Mayetta, or Grain Valley. 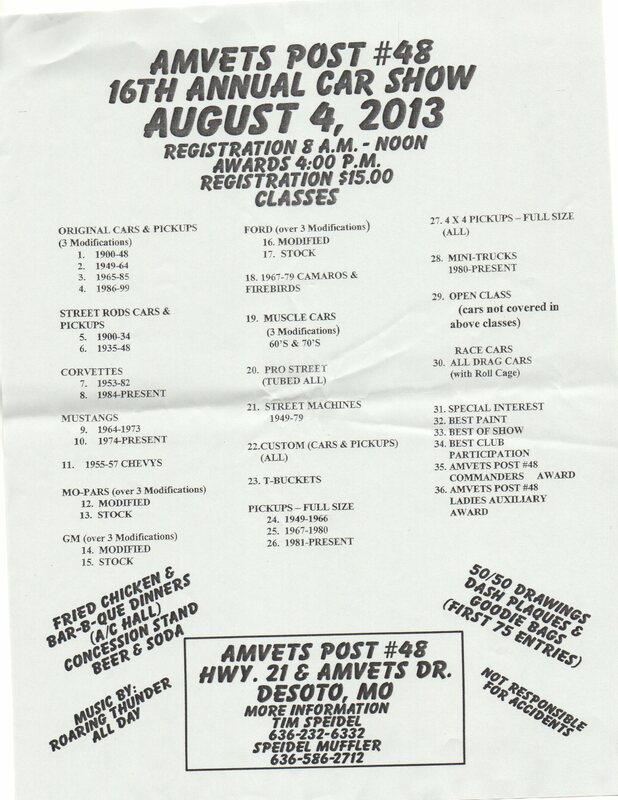 Or see a demolition derby at the Leavenworth County Fair in Tonganoxie. Wherever your automotive interests lie, there will be something for you in the Kansas City car show, car cruise, and car racing calendar below. Wednesday, July 31. Kansas City, Mo. Dale Wilch's Man Cave Indoor Swap Meet. 1501 West 31st Street, 64108. 6:00 p.m.-9:00 p.m. For more information, call Dale at (913) 788-3219, e-mail dale@rpmcat.com, or visit http://www.dalewilch.com/. Wednesday, July 31. Independence, Mo. 40 Highway Big Boy Cruise Night. 12401 E 40 Highway (40 Highway and Crysler Avenue), 64055. For more information, call Mike at (816) 519-6424. Wednesday, July 31. Overland Park, Kan. Cruising Red Robin. 7111 W. 95th (95th and Metcalf) 66212. 5:00 p.m.-9:00 p.m. For more information, call Andrew at (913) 642-9800. Thursday, August 1. Prairie Village, Kan. Cruising Down Memory Lane. 7100 Mission Road. 4:30 p.m., with police-escorted parade at 8:00 p.m. For more information, e-mail jjack@welcomekc.com. Thursday, August 1. Independence, Mo. McDonald's Cruise Night. 16235 E 24 Highway (east of M-291 Highway on US 24 Highway), 64056. For more information, call Jim at (816) 985-4317. Thursday, August 1. Joplin, Mo. Cruise Route 66. Downtown Joplin, 602 South Main Street, 64801. 6:00 p.m.-8:00 p.m. For more information, visit http://route66internationalfestival.com/ai1ec_event/cruise-route-66/?instance_id=4. Friday, August 2. Galena, Kan. TV and Movie-Themed Car Show. 5:00 p.m.-9:00 p.m. Main Street. For more information, visit http://route66internationalfestival.com/schedule.html. Friday, August 2. Overland Park, Kan. Longbranch Saloon TGIF Cruise. Longbranch Alehouse, 9095 Metcalf, 66212. 5:00 p.m.-9:00 p.m. For more information, call (913) 912-7344. Saturday, August 3. Parkville, Mo. Parkville Monthly Cruise Night. English Landing, Historic Downtown Parkville. 4:00 p.m.-8:00 p.m. For more information, call (816) 505-2227, or e-mail msparkville@sbcglobal.net. Saturday, August 3. Olathe, Kan. Wheels n’ Squeels Car Show. Olathe Bible Church, 13700 W. 151st Street, 66062. 10:00 a.m.-3:00 p.m. For more information, call Charles at (913) 568-8553, e-mail ccasteel@phenixlabel.com, or visit http://www.wheelsnsqueels.com/. Saturday, August 3. Lindsborg, Kan. Smokey Valley Car Show. Swenson Park. Registration begins at 8:00 a.m. For more information, call (888) 227-2227, or visit http://www.lindsborgcity.org/index.aspx?NID=864. Saturday, August 3. Hume, Mo. Hume County Fair Car Show. Downtown Hume, NE corner of the Square. Registration begins at 11:30 a.m. For more information, call (660) 643-7637. Saturday, August 3. Joplin, Mo. Route 66 Car Show. Downtown Joplin, 602 South Main Street, 64801. 5:00 p.m.-8:00 p.m. For more information, visit https://www.facebook.com/Route66JoplinMO. Saturday, August 3. Independence, Mo. Summer Cruise-In at the Hartman Heritage Center. Jackson Drive next to Buffalo Wild Wings. 6:00 p.m. For more information, call Jim at (816) 808-1154. Saturday, August 3. Spring Hill, Kan. Classic Cruisers Cruise Night. Sonic Drive-In, 909 North Webster, 66083. 6:00 p.m. For more information, call Dennis at (913) 375-0023. Saturday, August 3. Harrisonville, Mo. Heartland Road Runners Cruise Night. Gaslight Shopping Center, 1919 N Commercial, 64701. 4:30 p.m. For more information, call Clint at (81) 769-7879, or visit https://www.facebook.com/pages/Heartland-RoadRunners/514679805237999. Saturday, August 3. Springfield, Mo. 24th-Annual All-Ford Show. Friendly Ford, 3241 South Glenstone. 8:00 a.m.-3:00 p.m. For more information, call Russ at (417) 887-9270, or visit http://gomc.org/. Saturday, August 3. St. Peters, Mo. Bulldog Classic Cruise. Ft. Zumwalt South High School, 8050 Mexico Road, 63376. 10:00 a.m.-6:00 p.m. For more information, call Tabitha at (636) 443-3019, or visit http://fzsband.com/car-show/. Saturday, August 3. Lee's Summit, Mo. Pappy's Pizzeria Cruise. 405 NW Blue Parkway, 64063. 3:00 p.m.-8:00 p.m. For more information, call Phil at (816) 524-2100. Saturday, August 3. Garnett, Kan. Lake Garnett Cruisers Rolling Cruise Night. Garnett Town Square. 5:00 p.m.-9:00 p.m. For more information, call Susan at (785) 448-6412, or Twyla at (785) 448-4024, or visit https://lakegarnettcruisers.com/. Saturday, August 3. Troy, Mo. 9th-Annual Memories on Main Street Car Show. Enter at College/Main Streets. For more information, call (636) 462-8769, or visit http://troyonthemove.com/. Sunday, August 4. Kearney, Mo. American Iron Truck and Car Club Sunday Cruise Night. Held in Downtown Kearney, Washington Street. 5:00 p.m.-8:30 p.m. For more information, call Troy call (816) 377-3271. Sunday, August 4. Overland Park, Kan. Mr. Goodcents Cruise Night. 8808 Santa Fe Drive, 66212. 3:00 p.m.-7:00 p.m. For more information, call Singh at (913) 649-2244. Sunday, August 4. Kansas City, Mo. Art of the Machine Series featuring the Santa Fe Trails Antique Motorcycle Club. City Market of Kansas City, 20 Genessee St., 64102. For more information, call Deb at (816) 842-1271, or visit http://thecitymarket.org/events/art-of-the-machine-car-series. Sunday, August 4. DeSoto, Mo. 16th-Annual AmVets Post #48 Car Show. 1075 Amvets Drive, 63020. 8:00 a.m.-4:00 p.m. For more information, call Tim at (636) 586-6332, or visit http://www.johnskinker.com/files/Amvets_August_4th.jpg. Friday, August 2. Kansas City, Kan. Weekly Racing Series. Lakeside Speedway. 5615 Wolcott Drive, 66109. 7:30 p.m. For more information, call (913) 299-9206, or visit http://www.lakesidespeedway.net/. Friday, August 2. Grain Valley, Mo. Valley Sprints. Valley Speedway, 348 E Old 40 Hwy, 64029. For more information, call (816) 229-2222, or visit http://valleyspeedway.com/. Friday, August 2. Topeka, Kan. Street Legal Test and Tune. Heartland Park Topeka Drag Strip, 7530 SW Topeka Blvd, 66619. 6:30 p.m.-10:30 p.m. For more information, call (785) 862-2016, or visit http://www.hpt.com/. Friday, August 2. Atchison, Kan. Weekly Racing Series. Atchison County Raceway. Sedgwick Road, north of Atchison. 1:00 p.m. For more information, call (913) 370.2520, or visit http://www.acraceway.com/. Saturday, August 3. Tonganoxie, Kan. Leavenworth County Fair Tractor Pull. Tonganoxie Fairgrounds, 22618 McLouth Road, 66086. 2:00 p.m. For more information, call (913) 683-4483, e-mail flatrockgelbvieh@yahoo.com, or visit www.leavenworth.ksu.edu. Saturday, August 3. Tonganoxie, Kan. Leavenworth County Fair Demolition Derby. Tonganoxie Fairgrounds, 22618 McLouth Road, 66086. 6:30 p.m. For more information, call (913) 683-4483, e-mail flatrockgelbvieh@yahoo.com, or visit www.leavenworth.ksu.edu. Saturday, August 3. Grain Valley, Mo. USRA Modifieds. Valley Speedway, 348 E Old 40 Hwy, 64029. For more information, call (816) 229-2222, or visit http://valleyspeedway.com/. Saturday, August 3. Topeka, Kan. Super 8 at Forbes Landing. Heartland Park Topeka Dirt Track, 7530 SW Topeka Blvd, 66619. 7:00 p.m. For more information, call (785) 862-2016, or visit http://www.hpt.com/. Saturday, August 3. Mayetta, Kan. Great Plaines Stock Car/WIX Filters Night. Thunder Hill Speedway. 11995 142nd Road, 66509. 6:30 p.m. For more information, call (785) 966-2844, or visit http://www.racethunderhillspeedway.com/. Saturday, August 3. Wheatland, Mo. Race to Save the Hunt Night. Lucas Oil Speedway, 700 E Hwy 54, 65779. For more information, call (417) 282-5984, or visit http://www.lucasoilspeedway.com/. Saturday, August 3. Lebanon, Mo. Central Bank Night at the Races. Lebanon I-44 Speedway. 24069 Route 66, 65536. For more information, call (417) 532-2060, or visit http://i44speedway.net/. Always remember to call ahead for bad weather and scheduling changes!